That two-day hangover was mine in real life. But…home for me, then, was Vancouver, not the New Zealand of the story. Our boozy real-life night ended up…at First Avenue, the Minneapolis nightclub made famous by Prince – the Purple One – and the setting of much of his 1984 film Purple Rain. Life fuels fiction; fiction holds truths that sit, waiting to resurface – waiting for an invitation to write about purple – and to connect. Anchored by concepts of colour and vision in science, art and language, ‘Do You See What I See’ explores – and celebrates – the slipperiness of colour and perception, and the equally slippery space where fact and fiction meet. 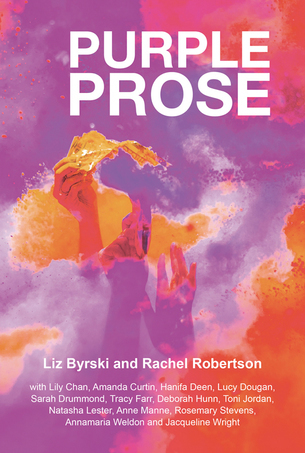 ‘Do You See What I See’ is Tracy Farr’s contribution to Purple Prose, an anthology conceived and edited by Rachel Byrski and Rachel Robertson. The book collects fifteen new works of non-fiction by Australian women writers, each responding to the colour purple. Purple Prose features new works by Amanda Curtin, Lily Chan, Hanifa Deen, Sarah Drummond, Lucy Dougan, Tracy Farr, Deborah Hunn, Natasha Lester, Toni Jordan, Anne Manne, Rosemary Stevens, Annamaria Weldon and Jacqueline Wright. In this richly varied canvas of memoir and personal stories crafted by some of our best women writers the importance of relationships resounds.